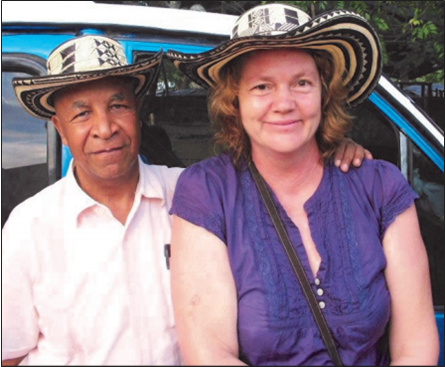 After 28 years in Nicaragua, Lillian Hall, right, has moved to Colombia ‘at the most auspicious of times.’ She is pictured here with her partner, Ricardo Esquivia, founder of Sembrandopaz, or “Sowing Seeds of Peace.” Hall was active at CUSLAR from 1980 to 1983. Can you introduce yourself and tell me about your role with CUSLAR? Lillian Hall: I grew up in Arizona along the Mexican border, about an hour away from Mexico, so I was always interested in Latin America. I got to Cornell University in the fall of 1978 to study international agriculture. Of course a lot was happening in Latin America in the late ’70s and early ’80s. I found out about CUSLAR because of a flyer for the Latin American film series. I think it was “Batalla de Chile,” which was a really powerful film that knocked me off my feet. After that I started going to all of the CUSLAR events. Through the CUSLAR Newsletter, the forums, the movies and all of the activities and protests, it was about educating people about what our government was doing in Latin America. It’s our government doing it — the people we vote for, with our tax dollars — so that makes it our issue. In those days there was a huge focus on education and activism, because it’s not enough to know — you need to take action. I had lost touch with CUSLAR for a long time, and I actually hadn’t even gone back to Cornell for about 30 years. Then I ran into Tim Shenk in the Dominican Republic at a conference of historic peace churches, and we started talking. I said, ‘CUSLAR still exists, that’s fabulous!’ I admire the tenacity to keep going and educate new generations. L.O.G. : I understand that you’re living now in Colombia, and you spent almost 30 years in Nicaragua. L.H. : I went to Nicaragua in December 1982 precisely because of the work I was doing with CUSLAR. The Sandinistas had overthrown the dictatorship in July of 1979. They had initiated the literacy campaign, and they were starting all sorts of exciting things in terms of health and education and land reform. It was a vibrant, exciting sense we got from people who were proud about what they had accomplished. At the same time, they had received this country in physical ruins and financial ruins, and that wasn’t daunting them. Then when I moved back to Nicaragua two years later in 1984, it was totally different. So I was lucky I got to see Nicaragua kind of at its best, before the war really squashed many things. L.O.G. : What was it like to go back in 1984? L.H. : In 1982 I didn’t want to come back to the U.S., but I said, I’ve got one more semester at Cornell, and my education is such a privilege. I need to get my degree so that I can be useful. So I went back and graduated, and then I worked for a year in Tucson to save up my money to go back to Nicaragua. That next time, I stopped in El Salvador on the way. In contrast with Nicaragua — in Nicaragua, you’ve got internationals coming from all over the world to participate in a revolution or to witness it or to pick coffee — in El Salvador there was none of that. I feel fortunate I got to see that, because in El Salvador there were still death squads, there was still the fear, and being in a place like that helped me understand why Nicaragua had to have a revolution. I got to Nicaragua in September of 1984, and what I saw was a country that had been completely militarized. There were soldiers all over Managua. There were tanks in the streets because they were expecting the U.S. to invade. It was really night and day, the difference between 1982 and 1984. L.O.G. : Can you talk about your hopes for the future for CUSLAR? L.H. : It boils down to stories — telling people’s stories, and putting a human face on all of these issues, whether it’s economic justice or mining or workers’ rights. That’s one of the great things that CUSLAR can give us: being that conduit among people of different countries and helping those stories come north to where a lot of these problems originate. My dream for CUSLAR is that it continues to not only maintain itself but to grow and to adapt to these changing situations. The CUSLAR of today can’t be the CUSLAR of the 1980s because the world is a different place. I’m excited that it has been able to evolve and grow in different parts of the world.